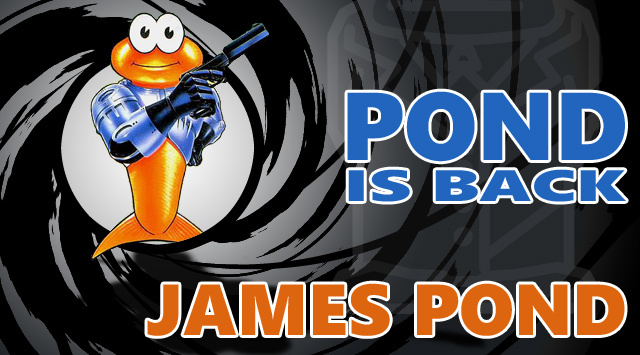 Exclusive: 3DS And Wii U Versions Of New James Pond Game Are "Part Of The Plan"
"What platforms we support will be up to the fans"
As we reported last week, everyone's favourite underwater agent is getting a revival thanks to Kickstarter and there's a good chance he'll be making a splash on the Wii U or 3DS — or perhaps even both. We've been talking exclusively to Chris Sorrell — the man behind James Pond — and PJ Belcher, the person in charge of the new project at current IP holder, Gameware. Thankfully, both are keen to see the fishy hero appear on Nintendo's consoles. James Pond may have started on a computer (the Amiga) but aspired to be a console game even before the first console versions were created (Sega Megadrive and SNES). There's no doubt it would be fantastic to see him return on either (or even both) of Nintendo's modern systems. In both cases the opportunity to design features for a second screen could certainly bring new elements into the game, perhaps an interactive level map or alternative ways of interacting with NPCs and boss characters? Definitely some cool possibilities to consider! Personally I would like to work on a Nintendo platform having never actually done so! We very much believe that Pond belongs on console and the fan base is showing a huge amount of love for the Wii U! The Wii U and 3DS are of course in our project plan, but what platforms we support will be up to the fans. We're offering a unique opportunity for the backers to vote on which platforms they would most like to see Pond appear on, and they are the ones that we'll target. Obviously each platform has its own design considerations beyond a basic port (2nd screen for instance) and we will of course will be looking for ways to make the most of these unique features. While the Mega Drive / Genesis version of Robocod is possibly the most famous, people have very fond memories of Pond on the SNES — on which it was called Super James Pond — and to see Pond back on that system's modern equivalent would be awesome! The initial funding amount is a very modest £100,000 (around $160,000) with multiple stretch goals for additional features that the backers get to vote on. This way the money is spent exactly how the backers want it to be. It also helps ensure that a new Pond game is not only made, but made how the fans want it to be. Will you be backing this campaign when it eventually goes live on Friday? Let us know by posting a comment. Haven't even thought about this character since the SNES was fresh and new. I'm still baffled by this. It's almost as if developers are having a contest on who can bring back the most irrelevant and forgotten franchises from gaming history. Next we'll see a Bubsy rebirth or Magmax sequel. Actually, there better damn well be a Magmax sequel in the works. oh god, i dearly hope this is one kickstarter that does NOT get the backing its asking for.... the games (apart from the first) were all utter crap and this just sounds like some guy trying to get money for something that was forgotten long, LONG ago. I remember playing this on NES and another console pretty sure it was the 3DO, both where totally ... alright, if your after a so so gaming experience James Pond definitely delivers. Played the demo to death on the C64. A Wii U remake? Yes please! It'll be the first kick starter I've ever backed. Want to see DJ Puff on Wii U next. @Neram If Bubsy went back to his 2D roots, I'll be all for it. An Amiga character who's a joke on movies. Gonna be hard to revive. But maybe, with the new Robocop film coming out as well, now is the right time. And not that James Bond isn't exactly known for the silenced gun anymore, he could get a chance to upgrade his arsenal. I immediately thought of Bubsy too. And then Zool, right after. Definetly backing this! Loved the first two James Pond games. Especially the second, a total classic. Lets hope they forget Aquatic Games and focus on Robocod as a play base. Good luck guys!